10440 Wyton Dr. returns to market in Little Holmby at a new asking price of $2,995,000. 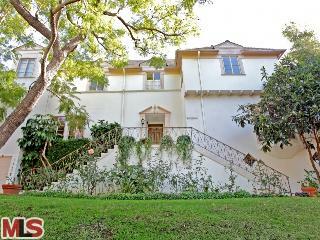 This home had previously been listed 1/15/09 for $3,895,000 and was reduced down to $3,670,000 before being withdrawn off the market on 8/28/09. According to the MLS, this home is a 6 bedroom / 5.5 bath, 4,555 sq ft of living space on a 15,899 sq ft lot.The house is majestic looking as it sits above the street on one of the premier streets in Little Holmby. If you look up and down the block, there are several other majestic looking homes to where this home fits right in. The floorplan is pretty standard with nothing too funky about it. The bedrooms and public rooms are large in scale, especially the master. While the house looks to be in good condition, the kitchen and bathrooms could use modernizing. For example the master bathroom looks to be original, however it is very large. I could see one just demolishing it and starting over without having to move any walls, etc... Same with the kitchen, the space and shape look ideal, it just needs updating. Sometimes you find older Little Holmby homes, that are large in size, but have tiny master baths or tiny kitchens. This makes remodeling a little more difficult because you have to start moving walls around thus making it more expensive and more time consuming. Additionally, the home has a little guest house out back with a full bath and there is a large pool. One other unique feature the home has is an elevator that goes from the outside garage level..to the main level...and to the master bedroom. 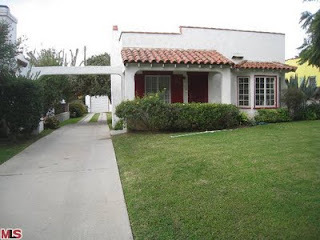 The Spanish home at 2207 Kelton Ave., LA CA 90064 is new on the market with an asking price of $825,000. According to the MLS, the home is a 3 bedroom / 1.75 bath, 1,462 sq ft of living space on a 6,750 sq ft lot. The home looks to be original in the kitchen and bathrooms. I am not sure if the master was added on at some point, but there is a rather large master bedroom for this size house in the rear. And this master bedroom is complete with a walk-in closet and an en-suite bath with a shower only (no tub) and a single sink. The lot size is large at 6,750 sq ft, which potentially provides space to add on, either by tearing down or just a plain old addition. One other thing to mention on this property is the location of the house is the 2nd house south of Olympic Blvd on Kelton. Hence the low $800's asking price. 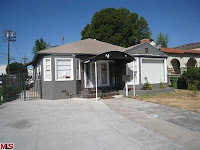 Lastly, I toured the Bank Owned REO at 2387 Malcolm Ave., LA CA 90064 with a Westwood low asking price of $700,000. According to the MLS, the home is a 2 bedroom / 1 bath, 1,135 sq ft of living space on a 5,793 sq ft lot. What's unsual about the property is there is no kitchen, at all, in the main house and there is a 4 car garage out back with an apartment on top of it. The apartment space does have a kitchen and a full bath. There is no mention of the square footage of the apartment, but it is pretty large, covering the entire top of the 4 car garage. 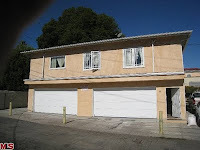 The house is the last house before the alley on Malcolm, which lines up to the back of commercial property on Pico Blvd. In addition to the 4 car garage, there is at least outside parking for 4+ cars.